In recent seasons, the Raiders have had a carousel of coaches, rotating through Tony Sparano, Dennis Allen, Hue Jackson, Tom Cable, Lane Kiffin, Art Shell, Norv Turner, Bill Callahan and Jon Gruden. And that’s just since 2000. Now it’s Jack Del Rio’s turn. And this time, John Madden thinks the Raiders picked the right man for the job. Madden, the former Raiders head coach and Pro Football Hall of Famer, has served as an adviser for Raiders owner Mark Davis. By many accounts, he liked what he saw of Del Rio during the Raiders search process for a new head coach this offseason. 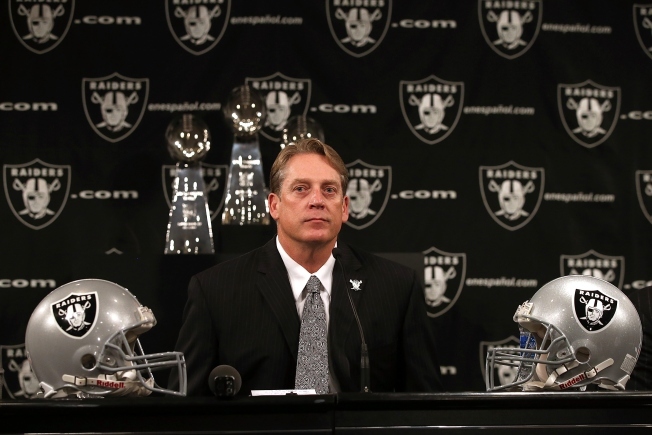 Now, in a wide-ranging question-and-answer story with Sam Farmer of the Los Angeles Times, Madden gives a big thumbs up to Del Rio as the man to lead the Raiders’ climb up the NFL ladder after so many years near the bottom. He specifically said that Del Rio is better for the Raiders right now than a young, up-and-coming coordinator who might be the flavor of the moment. “Jack Del Rio is the right coach for them,” he told Farmer. “I don’t think they needed that guy that’s on the sideline with the play card up against his mouth. Those are the guys that ascend quickly. Jack’s not that guy. “He understands you can help a quarterback as much by building a defense as you can by getting him a receiver. He’s going to make them legitimate. They lived on the myth that the Raiders are tough and all that for a long time, when they weren’t. Del Rio, a former longtime NFL linebacker, said as much when he took over the team earlier this offseason. He says the Raiders have to change their mindset.